A native of New Hampshire and a graduate of Dartmouth College and Boston College Law School, Attorney Hutchins was admitted to the New Hampshire State and Federal Bars in 1983 and is in his 30th year of legal practice in New Hampshire. He served as President of the New Hampshire Bar Association in 2001-2002. He currently remains an officer of the Bar Association, serving as the organization's Secretary. In 2010, Attorney Hutchins was voted the Best Personal Injury Lawyer in New Hampshire in NH Business Magazine. Attorney Hutchins has lectured extensively over the years at continuing legal educational seminars designed for lawyers in programs sponsored by both the New Hampshire Bar Association and the New Hampshire Trial Lawyers Association. 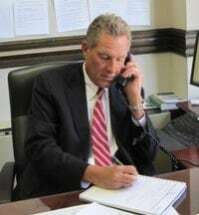 He has also appeared extensively on statewide television as a commentator on a variety of legal issues and cases, and has authored numerous editorials for the statewide newspaper on issues of immediate concern and importance to the legal profession and the pursuit of justice in New Hampshire. Attorney Hutchins has lectured on topics including insurance coverage, trial advocacy, sexual abuse litigation, civil procedure in New Hampshire courts, and the proof of damages in personal injury cases. In his spare time, Peter enjoys golf at Manchester Country Club and officiating high school basketball. His wife Kathy owns her own residential real estate agency in Manchester, and his daughter Jamie is an elementary school teacher in Candia, NH. From 2002 through the present, Attorney Hutchins has successfully represented over 150 victims of clergy sexual abuse in New Hampshire against both the Diocese of Manchester and a variety of religious orders and parochial schools. During this time, he has achieved between $15 and $20 million in settlements on behalf of his client victim/survivors. Since 2007, Attorney Hutchins has successfully settled several injury cases in excess of $1 million, and has settled a number of others in excess of $500,000. Attorney Hutchins has worked closely with organizations opposing domestic violence and sexual abuse, and has testified extensively before the New Hampshire House and Senate in support of successful legislation extending the civil statute of limitations in New Hampshire for claims by victims of sexual abuse, most recently in 2008 relative to SB 311 which extends the limitation to the age of 30.